FKLI did saw bulls gaining some strength with a close on Hammer, albeit closing in red, just a tick below yesterday's 1,607.5 close. Tomorrow may see a spill over of the Hammer effect, expect slight rebound, which may still be hindered by the short-term downtrend line from 1,705 peak. Including today's, there's been a 6th consecutive similar range candles traveling within a tight descending flat. 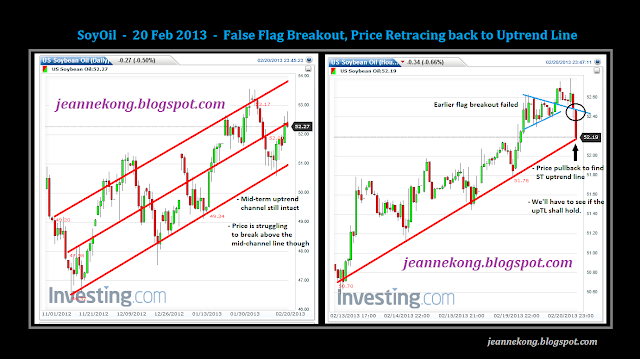 The setup is of striking similarity with the one saw near the peak mid-Jan. This can't help but excites me a lot, as we now know what happened after that, the dreaded Jan21 plunge. On CPO, bullish sentiment dented a little on weaker than expected Feb1-20 export figures. On the short-term, there's weakness in the bullishness, as today's slight pullback had gone beyond yesterday's low, despite a higher high formed earlier after the open. Bears seemed to have took over the control after the data release. However, on a mid-to-long term view, the uptrend is still intact. Still, bulls have to take out the immediate resistance level overhead at 2,590-2,600 as soon as possible, to keep the bullish sentiment in place. Earlier in the evening saw a ST bullish flag breakout on SoyOil, which helped lifted CPO price, before bears push price down again to the day's lower close at 2,561. Same case for SoyOil, temporary weakness (earlier flag breakout failed at 2300h), but the mid-term bullishness is still intact. 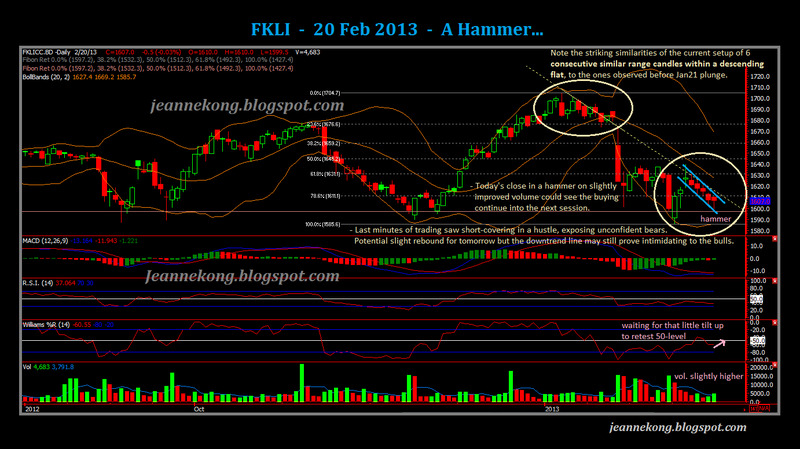 FKLI din go for a rebound as signal by yesterday's hammer. Instead, it broke lower to 1,593, looking like yet another candle within the flat range in the making. If bulls are unable to push price up to close above the 1,600 psychological level today, we may well see continuous drop ahead, without any significant rebound. As of writing, 1,595-96 level is holding nicely after rebounding from the morning low of 1,593. 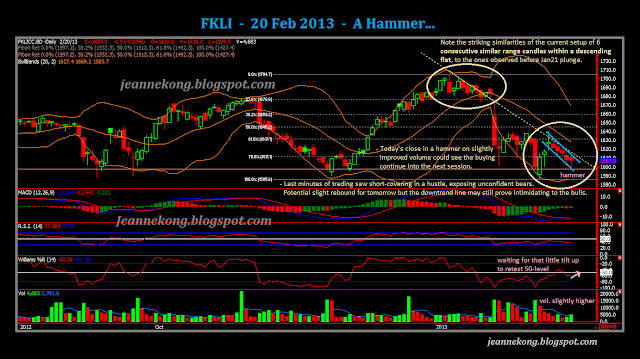 If it holds well, FKLI might see some rebound in the afternoon. CPO open with a big gap down to 2,516, forming a latest pivot at 2,585. Price quickly rebound back to 2,530 region, showing limited downside for the day. Note that price is currently sitting right on the daily uptrend channel (lower channel line), which has been a good support for the rally since Dec'12 low of 2,217. 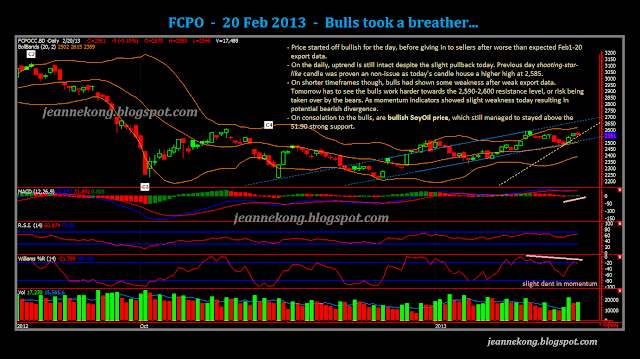 Although the daily uptrend is still intact, ST sentiment on CPO has now turned bearish. SoyOil has broken below its ST uptrend line, after failing a bullish flag breakout yesterday evening. Price now sitting on support level of 51.70. Strong support comes in at 51.30-51.40. ST sentiment has also turned bearish, for the moment.